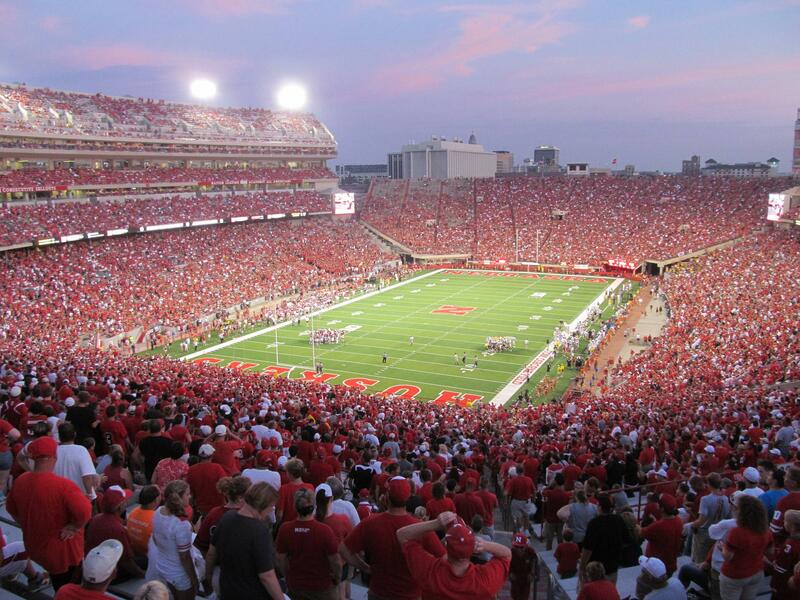 In Lincoln, Nebraska, there are few things that are loved more than Cornhusker Football. It's more than just a sport. More than just a game. It's a way of life and anything affiliated with the football experience sits on that same level. At each home game the Cornhusker Marching Band (CMB) makes their signature Block N and gets the crowd fired up during pregame before the team makes their grand entrance. The stadium is electric. For a high school senior that energy solidifies your decision of where you plan to go to school. And if you're a high school senior who also marches in your school's band, there is nothing bigger than coming to Nebraska and making the CMB. 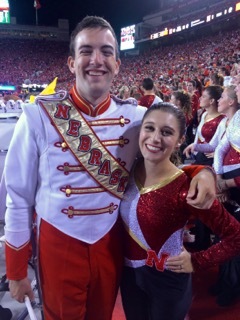 In November of 2010, two high school seniors met in the football crazed state of Nebraska and their journey together to the Cornhusker Marching Band would be hard work, but they would do it together. "We met in November through DOJO Percussion, an independent, indoor, competitive drum line. Jordan played bass drum and I was a dancer for the group, " explained Colleen Jareske. Jordan Leever's mom explained that after a few rehearsals he told her, "I kinda like one of the dancers. I'm going to sit with her on the bus and talk to her." After a 13-hour bus ride with the group the two were hooked. Once they started dating Jordan told Colleen that while sitting next to each other on the bus during that 13-hour ride, their knees accidentally bumped and Jordan was nervous that Colleen would think he was a creep. Oh the joys of high school romance. "One of my favorite stories is from New Year's Eve 2012-2013. We were with the band at Universal Studios for the bowl trip. I was so excited for our New Year's kiss. It would be or first ever New Year's kiss because the year before Jordan was away on the bowl trip. We weren't paying attention to the time when the next thing I knew, people all around me were cheering, celebrating the New Year...and Jordan was in the bathroom!" 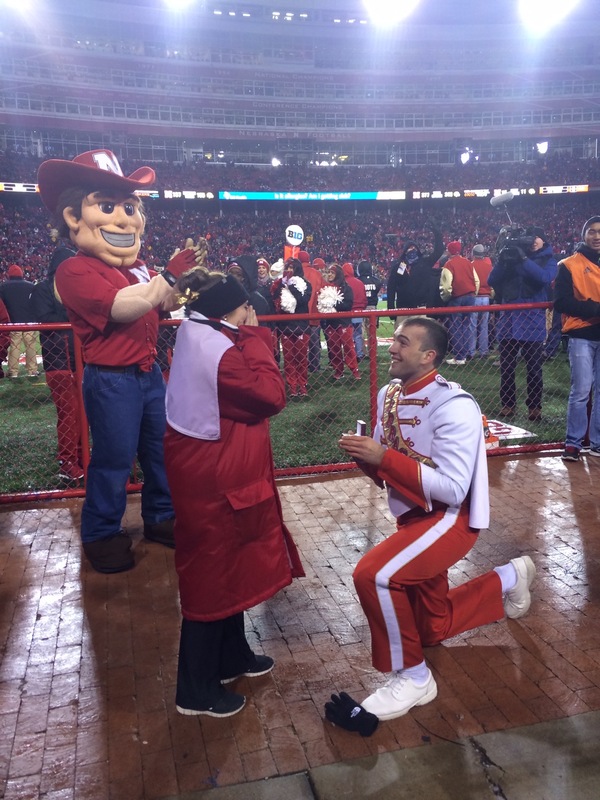 This season Jordan knew what was next, a proposal at the final home game of the year against undefeated Iowa. A huge game and a huge moment for the couple. Little did he know how difficult and hilarious proposing at a football game would be. After getting permission from Colleen's dad he still had one final permission he had to get before proposing. "I went into the CMB Director's office and told him my plan," said Jordan. "He told me he couldn't guarantee anything but that he had nothing against me proposing during the game, just not on the field!" "On the morning of the game, before rehearsal, I was able to slip the ring and box into my hat without anyone seeing it. There were a couple of times, like when I had to take my hat off for our senior day recognition, that the ring almost fell out of the netting. I caught it and buried it in my hat again." "During the game my mind was on the proposal; was I going to screw up what I wanted to say, when exactly was it going to happen? Finally the time came during the game and the band started playing Hey Baby, so I ripped off my overcoat, hat and gloves and then ran down the opposite side of the stands so Colleen couldn't see me. I had arranged for someone else to hand me the ring once I got down to the concourse, so that I wasn't digging around for it in my hat. I got down there, got the ring and then all of a sudden the band stopped playing! The timeout had ended and the game had started again. I didn't know what to do! I looked up at the drum majors and they said they had to stop, but would be able to play it again at the next time out. So I waited... and I waited..."
"Finally they started again. I moved away from the wall and waited for Colleen to come down the stairs. She came down and turned her back to me! She didn't see me down there, so I had to make eye contact with her friend Megan and motion to turn Colleen around. Once she turned around she saw me and hopped over in the cute way that she does. As she got closer she realized something was up. She stopped hopping and put her hands up to her face in disbelief. I got down on one knee and proposed." "The next thing I remember was Herbie, our mascot, coming up to give us a hug, then Der Veiner Schlinger (the guy who launches hot dogs into the crowd) came up and gave us two free hot dogs, so Colleen and I had our first meal as an engaged couple." Jordan and Colleen are happily engaged and excited to cap off their college band careers with one final trip this year to the Foster Farms Bowl against UCLA before they graduate. We wish them the best of luck as they embark on their lives together after college and start planning their wedding!